The goal of this article is recommend the best way to clean laminate flooring for residential homes. With this stated, you should know there are several best ways to clean to clean laminate flooring. In a prior article written and published on this website, the recommendation of suing a steam floor mop was the best way to clean laminate flooring. However, steam floor mops are relatively inexpensive, they are an investment. In the event that a steam floor mop is not in your budget or for any other reason will not work in your home, we recommend the following product types, tools and supplies as a best way to clean laminate flooring. 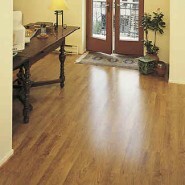 Laminate floors come in a variety of colors and types including wood and vinyl to surfaces. If the laminate is true wood and not a faux vinyl wood, please make sure you use precautions when cleaning with the most important being to not over wet the wood laminate floor. It is always a good idea to check with the manufacturer of the laminate flooring to insure that the cleaning method you select will not void any warranties. The flooring manufacturers can be very specific on what can be used and not sued on certain flooring types. The following recommended best way to clean laminate flooring will not harm the laminate floor as long as you follow the label instructions of the products used to clean the floor. But, if you were more interested in regular cleaning procedures for laminate floors using a steam floor mop, please see a prior article written on routine cleaning for residential laminate floors (Best Way to Clean Laminate Floors – Residential). Dust mopping is the first step prior to any wet cleaning. Dust mopping removes all loose soils from the floor and we recommend a microfiber dust mop such as from Bona or Swiffer. Wet cleaning is best accomplished to achieve excellent results by using a flat mop microfiber wet mopping system like Bona or Swiffer. These systems can be used with pre-mixed cleaning agents in a cartridge and because it is dispensed directly in from the mop handle, it allows you to control the amount of cleaning solution on the floor and thus assisting in over wetting the floor in case you are cleaning actual wood laminate flooring. The microfiber cloth does a superior cleaning job over conventional floor mops. The small microfibers grab and hold soil trapping it so it can be discarded when the cleaning task is completed.